At least once in your life, you probably experienced writing a questionnaire or responding to one. It could be a research questionnaire for a school project or some personality questionnaire that you found online. 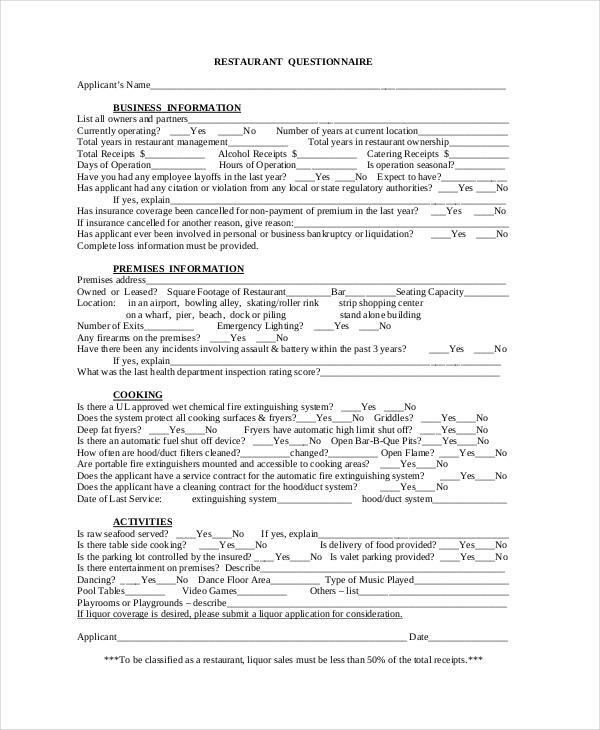 Regardless, you may have come to terms with the fact that questionnaire making is no joke. A questionnaire is made for a defined purpose. Businesses design survey questionnaires in order for clients or customers to provide feedback on a current product or service. It is also a way for them to crowd source on new product developments and releases. It would require sufficient time and resources, but it’s sure to deliver a useful outcome. 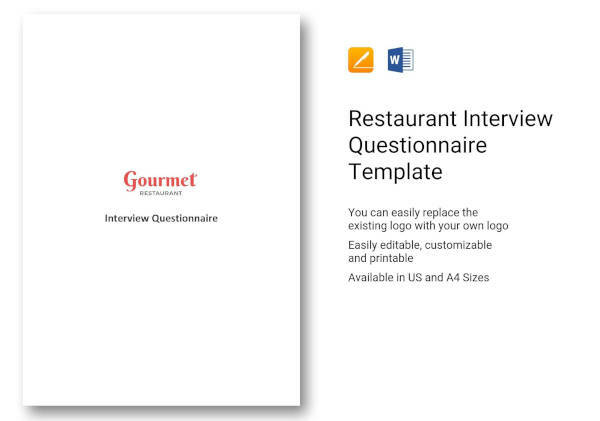 What Is a Restaurant Questionnaire? Restaurants greatly rely on customer feedback in developing marketing strategies, introducing new goods, as well as improving products and services. As consumers, the common restaurant questionnaires that we encounter are designed to monitor staff and customer satisfaction. 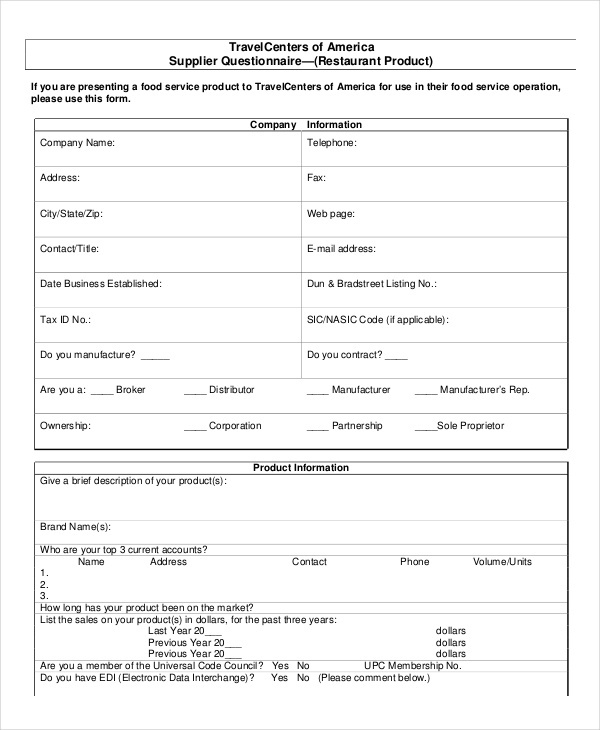 Other restaurant questionnaires are used for business operations, such as for corporate shares and collaborations. 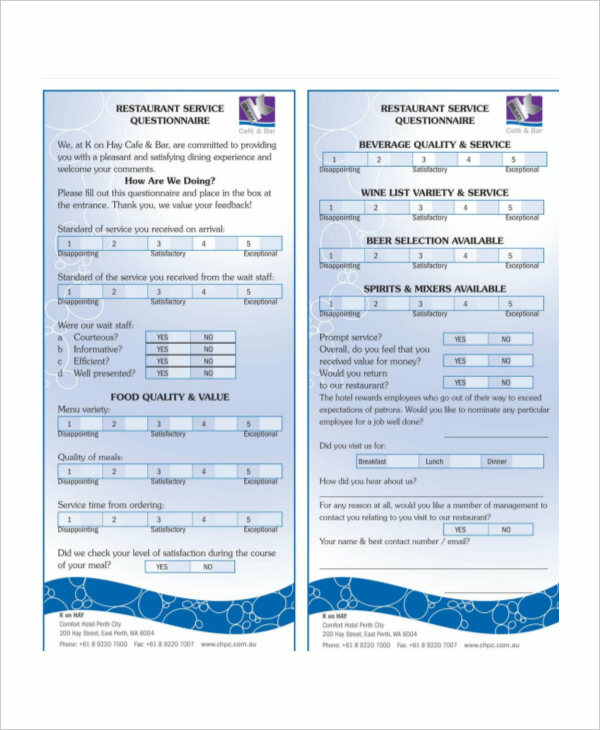 There are questionnaire templates and examples that you can refer to for a better understanding. How to Design a Questionnaire for a Restaurant? The design of your questionnaire will depend on its purpose. 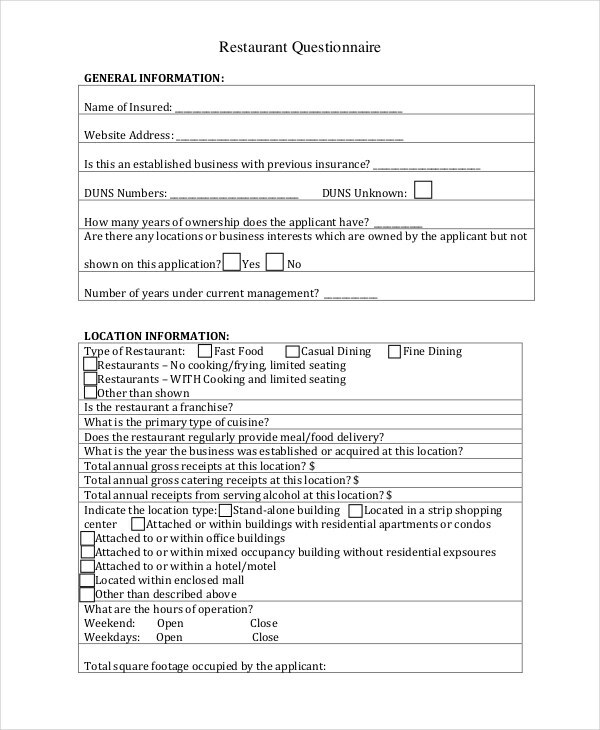 For formal business purposes, the questionnaire should include basic company information. Questions relating to the company’s legal operations will also be asked. For a restaurant questionnaire on customer feedback, questions are divided into sections. A respondent will be asked to give an insight on certain products. They will also be asked to comment on the restaurant’s customer service, such as the attitude and efficiency of staff members. This type of survey questionnaire will allow the restaurant’s management to further evaluate existing issues and work on resolving them. 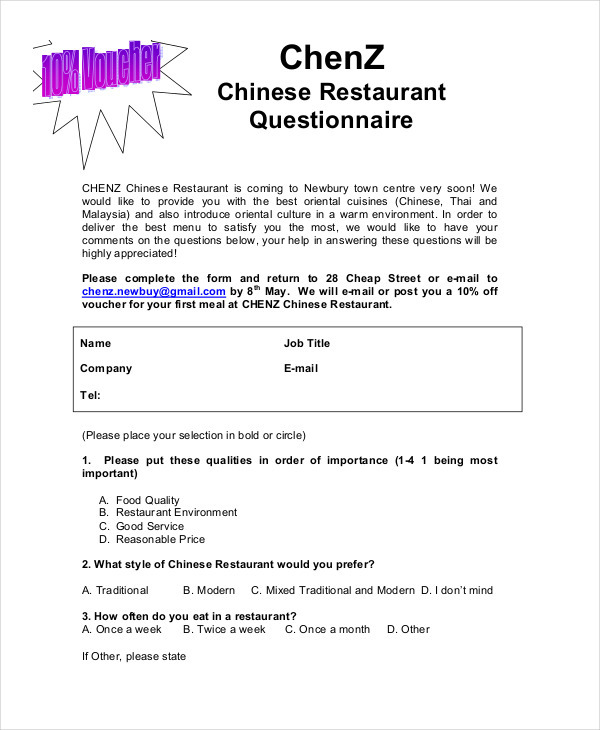 The type of questions in a restaurant questionnaire are designed in a way that allows customers to provide ratings and personal comments. There are things to remember when writing a questionnaire. An effective restaurant questionnaire will motivate respondents to answer truthfully instead of skipping questions that they don’t want to answer. When this happens, it will be difficult to draw conclusions due to insufficient data. Have a friendly approach. Respondents should not feel like they are forced to answer in a certain way. Use words that promote a positive vibe. Keep it short and simple. Ask direct questions and make sure they are necessary for improving business operations. Include ratings and yes/no questions. It would be easier for customers to answer these types of questions as they are often direct to the point. Make room for suggestions. At the end of the page, it’s best to include a suggestion box for respondents to provide their personal recommendation. You can use this as a point of consideration for ideas and solutions. 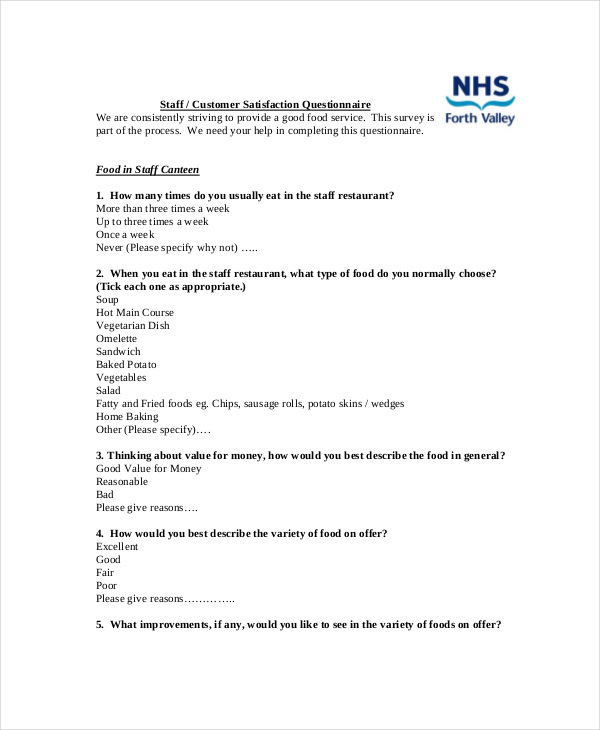 Make use of questionnaire templates and examples. If creating a questionnaire examples in pdf comes new to you, it’s best to use references from good sources. This will guide you with the questions you want to ask.